This post is part of a simultaneous St. Patrick’s day posting on Bushmills Black Bush by a large international group of whisky bloggers/writers. The idea originated with Johanne McInnis of The Perfect Whisky Match Blog. Thanks to Johanne for organizing and thanks to Joshua Feldman of the great blog, The Coopered Tot, for the sample. Seriously…who do we have to blame for the trainwreck that St. Patrick’s day has become in the U.S.? I’m pretty sure the original intent of celebrating the life of a hermetic, snake hating, previously non-religious, ex-slave-turned-evangelist Scot as the patron saint of Ireland did not include putting green food coloring in crappy beer. Maybe we should be blaming St. Durkee (the patron saint of cancer causing colorants) and St. Natural Light (the patron saint of just about the worst beer you can think of). Maybe we should blame whoever dyed the Chicago River green for the first time. What, that waterway isn’t dirty enough already as it is? Maybe we should blame the millions upon millions of young, American Euro-mutts, who on this one random day all of a sudden really get in touch with that 1/16th part of their heritage that is Irish. Never mind that these same Euro-mutts completely ignore other parts of their heritage and don’t do a damn thing to celebrate Saint Remigius’ Day. Maybe we should blame the guy who first came up with the idea of making a big, fleece, shamrocked, green & white, Cat-in-the-Hat hat? 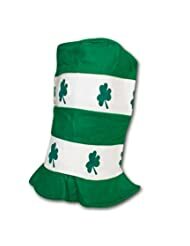 Maybe we should blame that guy’s friends for not locking him in a basement when they first heard that idea, thereby making sure that big, fleece, shamrocked, green & white, Cat-in-the-Hat hats never saw the light of day. Maybe we should blame Guinness and Jameson and all the other Irish booze brands that make piles of cash by telling everyone that on St. Patrick’s day, everyone is Irish, and, since we all know that everyone Irish is a complete drunk, now you, too, can be Irish if you drink these Irish booze brands until you can’t stand up on your own anymore. Face down in a pool of your own filth wearing a big, fleece, shamrocked, green & white, Cat-in-the-Hat hat and some green Mardi Gras beads…now THAT’s the way you pay homage to a Christian saint and to a nation and its people! It’s hard to say which is the biggest amateur night out there, New Year’s Eve or St. Paddy’s, Cinco de Mayo is getting there, but it’s a distant third at the moment, just ahead of…I don’t know…Easter, maybe? Anyway, If I may make an impassioned plea this St. Patrick’s day…JUST STAY HOME. Don’t give in to this hype. Don’t go to a bar with garish, cheap paper cut-outs of shamrocks and leprechuans. Don’t end up the subject of a picture that will eventually make the rounds as a humorous facebook meme. Stay at home, put some Dubliners or the Wolfe Tones (or Thin Lizzy or Stiff Little Fingers) on the hi-fi. Make a big pile of Colcannon, a loaf of soda bread, a boxty or two, maybe a little corned beef if it agrees with you. Read some Brendan Behan short stories or a little Flann O’Brien, and responsibly drink some excellent Irish Whiskey. There’s quite a bit out there at the moment, this segment of the whisk(e)y world is one of the fastest growing on the market. Instead of the ubiquitous Jameson or Bushmills white label, how about starting with Bushmills Black Bush? In the U.S., Black Bush was pretty much the only step up one could take from those aforementioned entry level bottles until other “premium” expressions began to appear on shelves. In that way, it’s something of a classic, and deserving of a second look. A longtime favorite, I reviewed Black Bush back in 2010, from booze most likely bottled in 2008 or 2009 at the latest. The first time around, I mentioned that Black Bush was aged for 8-10 years in Oloroso seasoned European Oak casks. A quick glimpse at the Bushmills website now tells me Black Bush is aged “up to seven years in Spanish Oloroso Sherry casks and sweet Bourbon barrels. Hmmm…quite a difference there. Thinking I might have royally screwed up that first time around, I poked around the internet a bit more, and to my relief found that my initial info was consistent with that “vintage” of Black Bush. Unfortunately, that same info that is still out there and being presented as current, even when it contrasts starkly with the info on Bushmills’ site. I know the company did a major redesign of their line a short while back, but I don’t remember hearing if the changes went deeper than that…apparently they did. So, like Bushmills says, this one is made up of 80% malt whiskey and 20% grain whiskey, aged for “up to” seven years in Spanish oak seasoned with Oloroso sherry and American oak ex-bourbon barrels. The Nose: Light, crisp and fruity. Clean malt notes, and juicy tart apples along with raisins and macerated cranberries. Behind those initial notes are subtler notes of slightly bitter grain, cocoa powder, dark chocolate, stewed fruits, and hints of almond cake. Tucked further back is a bit of greenish spice, burnt popcorn, and fresh cut oak. The Palate: Airy yet chewy mouthfeel, quite sweet and a little empty to start, but quickly fills out with more raisins and stewed fruit. The nuttiness that was hinted at on the nose comes through more on the palate, roasted and salted almonds and walnuts. A mild wave of tannic, slightly bitter spice rounds off the palate, vanilla extract, coarse clove, nutmeg, a little cardamom, and unsweetened baker’s chocolate at the end. Thoughts: Decent whiskey, but also disappointing. It’s fair to say I’ve drunk a fair amount of Black Bush in years past. It has been a while, many years, since this was a regular in my cabinet, and sad to say, in that time, I can’t help but think Black Bush has changed and not for the better. It’s not nearly as sherried and rich as I remember. It’s a brighter and livelier but also tastes a little more youthful and harsh. That said, it’s still a pleasing Irish blend, but unfortunately, I think its lost some of its “classic” depth and charm from years ago and has moved closer to its white label sibling. Black Bush used to be an excellent bang-for-yer-buck bottle, but I’m not sure I’d say the same now, especially with the ever-growing selection of Irish whiskies out there. I have found the flavor profile has changed also. Not as rich and powerful. Where no age statement is made on the label, the drinks company can play around with that age as apparently they have. They dont have to tell the public what they are either. Obviously, in the short term it is more profitable to reduce the aging time of the composite whiskies making up this one, but the question is whether such a decision is ultimately short sighted. I think so. Glad you thought so too, Jason. It’s been a while since I’ve had this one around and like I said, I was pretty disappointed. Even with age-statement whiskies, you have to expect some variation from “year to year”, but it really seems like they’ve completely changed Black Bush. If the old info was accurate and it went from 8-10 years in Euro-oak to 7 or less in a combo of Euro & American…well, that’s a completely different whiskey in my book. Granted, for a $30 bottle, one does not expect a lot of media uproar, but still, I poked around a bit and haven’t found any mention of such a drastic switch, or even a gradual one for that matter. As always, thanks for your thoughts, I appreciate hearing from you! #1 – Thanks for the photo credit. Guess you liked it or you wouldn’t have used it. Much appreciated! #2 – As I said in my review, I wasn’t expecting much from this Whiskey. I like Irish Whiskey, but it’s never my first choice, so I was pleasantly surprised when I actually enjoyed it. I was particularly impressed by the fact that at 40% ABV it had a bit of oomph. Nothing crazy, but more than I was expecting. That being said, I doubt I’ll be buying this again. While I don’t usually go out for St. Patty’s Day (kids and stuff get in the way plus., all of the drunken malarcky that occurs), I do have fond memories of a couple outings over the years. One involved an afternoon at McGillan’s Olde Ale House in Philly which was fun and mildly amateurish (there was also a girl involved, so that made it interesting), and the other involved a weekend in Newport, RI during an anniversary trip with Mrs. G-LO. A lovely little parade as well as some mellow dining and drinking in a lovely little pub. Also, Bangers and Mash washed down with a creamy Guinness. Yum! As usual, great write up! Thanks G-LO, and yes, thanks for making those pics available, you always take great shots. Sounds like we had similar impressions of Black Bush. I’m sure mine was tainted by the memory of how much better older versions were. As for St. Paddy’s shenanigans, I’ve had a few myself, but am much happier to skip the madness these days. (Here’s a dirty little secret: I didn’t have any whisky of any kind on the 17th and I can’t really remember if I even had a beer, so if I did it must not have been that great). Thanks again for the photo use! Regarding the photo, all I can say is anytime. Twas a pleasure! Truth be told I also did not partake of whisky or beer on the actual day of St. Paddy. I did have a bit of wine with my dad, but I doubt that counts. Saturday night was a different story. I had some Bushmills as well as several other Irish Whiskies (itty bitty pours all around. can’t afford hangovers anymore). Our gathering lasted until 2AM. Does that count as drinking whisky on St. Paddy’s Day?